(Seychelles News Agency) - Seychelles needs to look into new areas of the economy that are emerging for growth, said the undersecretary-general and the executive secretary of the United Nations Economic Commission for Africa (UNECA). 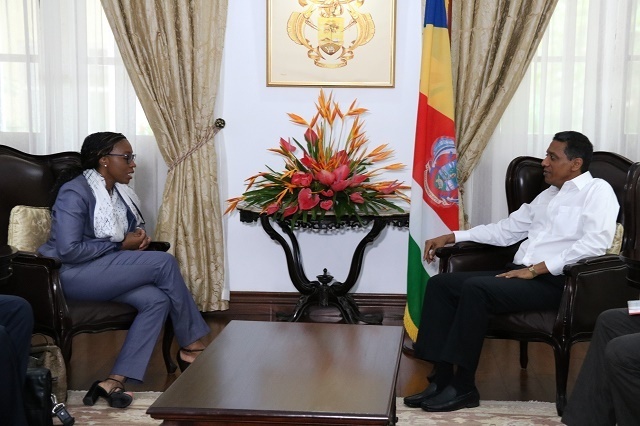 Vera Songwe made this statement after meeting with President Danny Faure at State House, Victoria on Wednesday during her one-day visit to Seychelles. “Today the Seychelles’ economy is dependent on the tourism and fisheries sector. Now we are looking at hopefully to get other parts of the economy into play. A lot of data on the different new parts of the economy is not included when we look at the different components of the economy,” said Songwe. Tourism and fisheries are the top two contributors to the economy of Seychelles, an archipelago in the western Indian Ocean. “We have been working a lot with Seychelles on statistics and on rebasing the Gross Domestic Product (GDP) of Seychelles. The island nation’s GDP per capita is about $16,000. We want to understand what the new transformation in the economy is and to do that we need to relook at the national accounts of the island nation as well,” she added. In his meeting with Songwe and her delegation, the President of Seychelles expressed his wish that this visit will help to consolidate the programmes that the government of the island nation has with UNECA. The discussion between the president and Songwe also touched upon the blue economy and how reference could be made to Seychelles in regards to that. “I think that Seychelles has a lot of experience that it can share with the rest of the continent and even the world on how one can make the blue economy an effective part of creating jobs and growing a more inclusive economy,” said Songwe. Also discussed was the Seychelles’ experiences and how these can shared with the rest of the world. “Of course we are the United Nations. We can bring the world to Africa and we can bring Africa to the world,” said Songwe. Another point raised during the discussion between Faure and Songwe was the Continental Free Trade Area Agreement. “The island economy has a slightly different characteristic, but it is not to say that they cannot benefit from the continental free trade agreement. So one of the things that we were proposing is to work with the government of Seychelles to see how we can make sure that the country actually benefits from the agreement,” said Songwe. The African Continental Free Trade Area (AfCFTA) is a planned free trade area, outlined in the African Continental Free Trade Agreement among 49 of the 55 African Union nations. Sopngwe also touched on the aspect of moving to a more digital world and said that ECA has launched a digital centre of excellence and would like to benefit from some of the experience of Seychelles. “We want to also strengthen some of the infrastructure that Seychelles has for better telephones as we move from a 3G space. We want to get the youth to come into this service economy, which is an economy we believe is going to be with a lot of hope and potential for the youth of Africa.